Robert Altman was one of the most important auteurs of 20th Century American cinema, as well as one of the most prolific. He has 89 director credits in his filmography (including the television directing that launched his career in the 1950s), and there were many times in the 1960s, 70s, and 80s when he would make two or occasionally even three films within a single year. He made a lot of classics: culturally-influential films like MASH, revered masterpieces like Nashville, and cultish cinephile favorites like The Player. But with such a huge filmography, it is no surprise that he also made a lot of films that slipped through the cracks, either not getting much notice upon their release, or becoming forgotten or overlooked in the sea of other films he made in the years since. One such forgotten film has now been belatedly rescued from obscurity by the fine folks at Arrow Video: his eerie and experimental 1972 psychological study Images. Despite being released in one of Altman's most prolific periods, between McCabe & Mrs. Miller and The Long Goodbye in the five years that separated MASH and Nashville, and despite being fairly critically acclaimed and taking home the best actress award at Cannes, Images failed to connect with audiences upon its release, and subsequently disappeared altogether, never even getting a US VHS release. It was considered something of a lost film in the Altman filmography for over 30 years, until it was finally given a DVD release in 2003; but that disc went out of print a few years later, and the film returned once again to hard-to-find obscurity. Seeing the movie for the first time on its new Arrow special edition, it isn't hard to see why it struggled to gain a following: Images is abstract and dreamlike in the extreme, highly impressionistic and unconcerned with a traditional narrative. It is a difficult film to digest, but is a fascinating and unnerving experience which fans of 1970s art-house cinema will surely appreciate. A psychological study which often takes on the feeling of a nightmare, Images has the tension and brooding atmosphere of a horror film, although it is not one in the conventional sense. It could be described as sort of a midpoint between Repulsion and Let's Scare Jessica to Death, although without the former's outright surrealism or the latter's horror plot tropes, and with a healthy dose of Persona mixed in. It is an examination of a woman slowly going insane, packed with eerie and mysterious images of a seemingly-idyllic rural environment twisted into a place of dread. Susannah York stars as Cathryn, an author of surreal, Fantastic Planet-esque children's fantasy books, who is slowly losing her mind to schizophrenia. Reality keeps shifting within her mind as she is tormented by a doppelganger of herself, and as she juggles toxic, mistrusting relationships with three current or former lovers (principally her possibly-unfaithful husband, Altman regular Rene Auberjonois) – at least one of whom isn't really there. The carefully-crafted dreaminess of the film keeps the viewer perpetually off-balance: the perspective constantly shifts from reality to Cathryn's fractured visions, so that we never know what is real and what is imagined, and even the more ostensibly realistic parts of the film (right down to the unspecified setting) are handled in such a way that they never feel quite anchored in the real world. Altman puts us in Cathryn's head extremely effectively, and as a result the viewer, like the protagonist, remains disoriented throughout, trying to keep their head above water and make sense of the kaleidoscopic puzzle. This approach is both the film's greatest strength, and the thing that makes it so inaccessible to most viewers; not everyone is going to like feeling as disoriented and unmoored from reality as this film makes you feel, especially in the absence of a clear, conventional narrative. The film was heavily improvised, or at least developed in workshops and rehearsals with the cast, and refractions of the actors themselves were worked into the film to accentuate the feeling of reality filtered through a mad mind. Each character has the name of another one of the actors (Susannah York plays Cathryn, Cathryn Harrison plays Susannah; Rene Auberjonois plays Hugh, Hugh Millais plays Marcel, Marcel Bozzuffi plays Rene), the surreal children's book that Cathryn is writing is an actual book that York was writing at the time, and York's real-life pregnancy was used to visualize Cathryn's anxieties about getting pregnant. The film also has very thick symbolism which is obvious in terms of its recurring visual motifs – lots of wind-chimes, cameras and lenses, reflections, and jigsaw puzzles – but a good deal less obvious and more open to interpretation in what they each mean to the narrative and characters. In a sense, these elements appear as recurring images in a dream would; they clearly have psychological significance to Cathryn, but exactly what that significance is requires some psychoanalysis and interpretation on the part of the viewer. These visual motifs are just one way in which Altman's film is visually rich and fantastically stylized, thanks largely to Vilmos Zsigmond's characteristically stellar cinematography. The motifs appear in ways both subtle and obvious, but are always striking. Zsigmond's camerawork frequently moves across that line between real and imagined, taking us out of the rational world and inside Cathryn's mind sometimes within a single camera move. The camerawork also makes gorgeous use of the ethereal, fog-draped Irish landscape which provides the film's main setting: Altman and Zsigmond love getting massively wide landscape shots in which the actors are tiny figures in a corner of the frame, dwarfed by the world around them and the mystery that it represents. These visuals are matched by the highly unique and impressionistic soundtrack by John Williams and Japanese experimental percussionist Stomu Yamash'ta, which rattles with sudden, unexpected bursts of noise as fractured and insane as the perspective of the film itself. Particularly given that Williams is most famous conventionally sweeping and epic film scores like Star Wars and Harry Potter, the abstract, experimental quality of this score is as surprising as it is excellent. Given what a visually and aurally rich film Images is, it is perhaps just as well that it never had to endure a pan-n-scan VHS release in America; its 2.35:1 cinematography is essential, and it is fortunate that both of its home video editions preserved that, even if it is unfortunate that such an interesting film has only ever gotten two home video editions. Arrow's 4k restoration of the film looks beautiful; a significant step up over the good for the time, but now rather dated 2003 MGM transfer. The film's soundtrack retains its original mono mix, but sounds great, with the Williams/Yamash'ta music shining through brilliantly. As always, Arrow has assembled an impressive array of extras, with the newly-produced content including an interview with the child actress who played one of the supporting roles, a half-hour analysis/appreciation of the film by author Stephen Thrower, and a commentary by film scholars and frequent Arrow contributors Kat Ellinger and Samm Deighan from Diabolique magazine. The interview with the actress provides some wonderful insights into Altman's highly collaborative creative process, and the commentary and analysis provide some invaluable background on the film, its style, its place in Altman's filmography, and its place in the various genres in which it dabbles. But honestly, the most valuable and interesting extras are the ones ported over from that 2003 MGM DVD. In the early-2000s MGM was notorious for putting out cheap bare-bones discs and skimping on extras, but thankfully they didn't do that with Images; instead they produced a very enlightening featurette based around thorough interviews with Robert Altman and Vilmos Zsigmond, and a scene-specific commentary with Altman in which he analyzes just over half an hour's worth of scenes from the movie with quite a bit of depth and detail. These extras are absolutely priceless, since both men are now deceased (Altman died just three years after that DVD was produced), and given what a long-neglected film Images is, it seems like a minor miracle that a major distributor like MGM cared enough to document their thoughts on the film while they were still living. Images is one strange and unusual film. A mix of horror atmospherics, psychological exploration, and inspirations from Bergman and Polanski, this has got to be one of the most unique entries in Robert Altman's always unique and eclectic filmography. That said, it is not for everyone, and is a difficult movie to swallow even for adventurous art-house viewers. It is aggressively disorienting, dreamy, and unreal, and the experience of viewing it is meant to be a less-than-pleasant sensation. But it is a fascinating puzzle, and an artistically bold one in every sense, from its reality-bending writing to its moody cinematography to its fractured musical score. Cinephiles willing to put in the work of such a kaleidoscopic psychological journey will find much to enjoy and be challenged by. 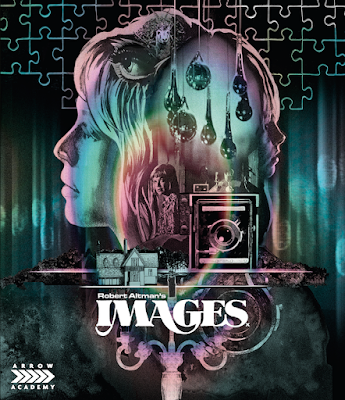 With this excellent special edition to provide some very helpful context (thanks largely to the archival input of Altman himself), Images is ripe for rediscovery and exploration.